Earlier this summer, I finished God's Crime Scene, by J. Warner Wallace. It was a simply fabulous book, and my first thought was, "I wonder how long until the 'for Kids' version is available." 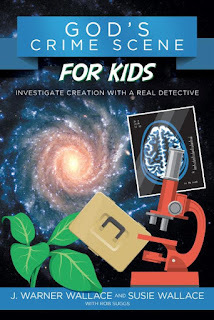 A couple of days later, I got an email about a blog tour for God's Crime Scene for Kids. Obviously, I signed up for that quickly. The tough part of writing this review is that most of what I want to say, I already said in my review of Cold-Case Christianity for Kids. This book follows the same format, is just as well-written, and is also a book that I think every parent ought to work through with their kids in the age range of 8-14 or so. The subject matter is different though. God's Crime Scene is focused on whether or not there is enough evidence to "convict" God of the crime of creating the universe. What I love about working through this with my 11- and 13-year-olds is that even though my kids have been through a lot of materials about "In the beginning..." and they end up getting a bit of the eye roll going when we come across the topic, this book presents the information in a way that is fun and engaging. We've been reading a chapter, while they fill in the answers on the pdf notes page. Then we watch the video on their website. The kids follow up by looking into some of the extra sidebar things in the book, and doing the game-type of pdf file as well. I'd love to be working with my older teens on God's Crime Scene, as it is incredibly easy to coordinate the two books. But it's been an insanely crazy month, and that just was not going to happen. I really do mean it when I say that I think every Christian parent of a 8-14ish year old should work through both of these books. And if you have teens, you should be getting a set of all three of the adult books for them (Forensic Faith for Kids is coming soon!). And you should have a set of your own too. I loved this book and can't wait to go through it with my son this year. I just finished getting my review ready for this week. I haven't figured out yet if I should get the first book in the series and start there yet since I haven't seen it! Definitely get the first one! I don't know that it has to be done first, but some of the stuff in God's Crime Scene for Kids does build on what was in Cold-Case Christianity for Kids. Not truly important stuff. That sounds like a great book. Thanks for the review!